This being the penultimate season of Kent Nagano’s tenure with the Orchestre symphonique de Montréal (OSM), it is no surprise that audiences are being treated to a parade of guest conductors. 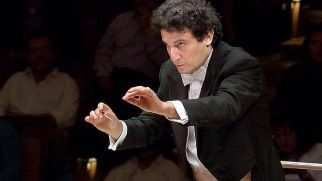 Of the eight programs offered so far this season, seven guests have conducted the orchestra. This week’s subscription concerts were led by the music director of Brussels’ Théâtre royal de la Monnaie–Alain Altinoglu. Altinoglu generally conducted with precision and a tight rein, but didn’t bring much extra to the interpretations of the evening’s works. The highlight was one of the OSM’s signature pieces— Ravel’s Daphnis et Chloé, Suite No. 2. The orchestra has performed this work so many times that they could have played it impeccably without the scores or conductor. Altinoglu did, however, lead a nuanced and detailed rendition of his own arrangement of Debussy’s Pelléas et Mélisande Suite. According to the program notes, his version consists of “eleven passages in strict chronological order, which collectively provide a musical and dramatic synthesis of the opera.” He maintained a even balance throughout with careful attention to the dynamic markings. It was marred only by Principal Trumpet Paul Merkelo who tends to play too loudly. Till Fellner performed Mozart’s Piano Concerto No. 27, his last, composed in the year of his death. It is more graceful and lyrical than most of his other later concertos, yet it could have been played with more color and expressiveness. Combined with insufficient rehearsal time, the performance had little impact. The evening opened with a luxurious rendition of Debussy’s Danse sacrée et danse profane, for harp and string orchestra. Jennifer Swartz, the OSM’s principal harp, played with softly textured delicacy and finesse.